Pork Belly Recipe, Very Succulent, Tender And Full Of Flavor. 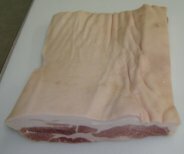 Pork belly is a boneless fatty cut, covered entirely with skin(rind) on the bottom side. Raw bellies also called side pork, is very succulent, tender and full of flavor. Raw bellies can be hard to find in most North American meat counters, today they are mostly exported to Asian countries where they are very popular. If you can not find this cut in your local meat shop ask your butcher to order it. In Canada and the US most pork bellies are smoked, cured and sold as bacon. 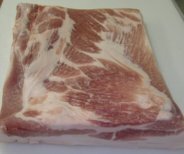 A cheap, easy and forgiving cut, pork belly is at it's best when roasted slowly in a low temperature, the fat allowed to melt away, the skin to crisp and crackle while the meat gently cooks. 1. This is an important step if you want crackling crispy skin, and there is no point cooking a pork belly if you don't. 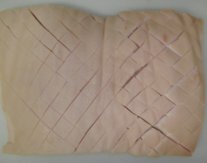 Place the belly skin-side up and score the entire surface of the skin. Use a sharp paring knife to cut down into the skin and barely into the fat, making sure not to cut into the meat. Cut parallel lines across the belly, spacing them about 1/2 inch(1cm) apart. Make a series pf perpendicular lines to create a diamond pattern in the skin ( see picture). If you don't have a sharp enough knife to cut through the skin, a utility knife can be used. 2. Preheat your oven to 500°F(260°C) and set oven rack to medium position. Making sure the skin is dry, generously rub salt into all the scores you've just made, pushing salt into the cracks in the skin. Season the other side of the belly with salt and pepper to taste. 3. Place the roast skin-side up into a roasting pan, big enough to hold the meat and vegetables. Place the pan in the preheated oven for 15-20 minutes. The high heat is to start the crackling of the skin. 4. Turn the heat down to 300°F(150°C) and roast for 1.5 hours. 5. Remove pan from the oven and carefully remove the pork belly and transfer to a plate or cutting board. Add the vegetables, thyme and garlic to the pan and stir into the fat. Place the belly back into the pan on top of everything, skin-side up. Place pan back into the oven and roast for another 1.5 hours. 6. Remove the meat from the pan, transfer to a serving plate. Tent loosely with foil 15-20 minutes. 7. This next step is for an optional gravy. Spoon away any fat in the pan. Add water or stock and place roasting pan on the stove over med-high heat. Bring to a boil, lower temperature and simmer 3-4 minutes, stirring with a wooden spoon until you have a nice dark gravy. Pour the gravy through a strainer into a gravy bowl. Add salt and pepper to taste, serve with mashed potatoes and fresh greens.